I haven’t heard the term “swell” for years. LOL This is just adorable! Made me laugh today. What a cute couple. 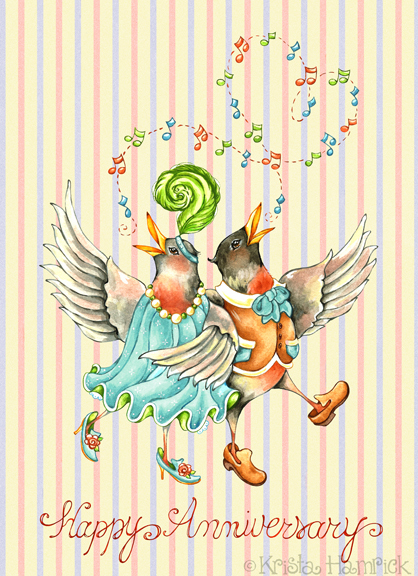 I love Robins, and this is just such a charming piece. They are adorable! How do you come up with these great characters? Oh my goodness, this is GORGEOUS, Krista! Love the detailwork in this sweet anniversary piece. Amazing. Hope all is wonderful in your world! It sure is! … and so is a visit to your blog Krista! Great characters and a great era piece! Puts a smile on my face and a skip in my step! it sure is….and this just sings happiness! how darling!